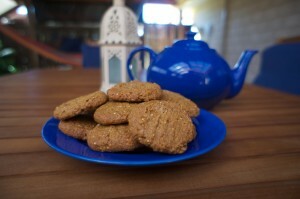 It is Anzac Day and felt inspired to try and bake some gluten free Anzac biscuits. I checked out various recipes and consider making some with my supply of Bob’s Red Mill Wheat Free Oats from USA. Oats that are not contaminated are considered gluten free in USA but in Australia they are not considered gluten free, mainly due to contamination issues but also as oats do contain a type of gluten known as Avenin. I have been eating a moderate amount of Bob’s Red Mill Wheat Free Oats for a while now with no ill effects. Consult with your health professional and read the Coeliac Australia position statement on oats here before you consider consuming them. So oats debate over found a recipe for gluten free Anzac Biscuits at Teresa Cutter’s The Healthy Chef website here. I did not have any flaked almonds so added more almond meal. I also used half cup of coconut and half cup of the World’s Best Cereal Porridge with Brown Rice Flakes, Quinoa, Cinnamon and Rapadura Sugar. Combine almond meal, coconut and WBC porridge. Combine honey and oil in small saucepan and heat gently. Mix the bicarb and water and pour into saucepan and mix until starts to go frothy. Pour into the dry ingredients and mix until combined, add a little water if needed. Form into small balls (about a teaspoon each) and place on baking sheet, flatten with a fork. Bake in low preheated oven, 120 degrees celsius, for about 30 minutes until golden. Allow to cool slightly before eating, taste delicious with a cup of tea! 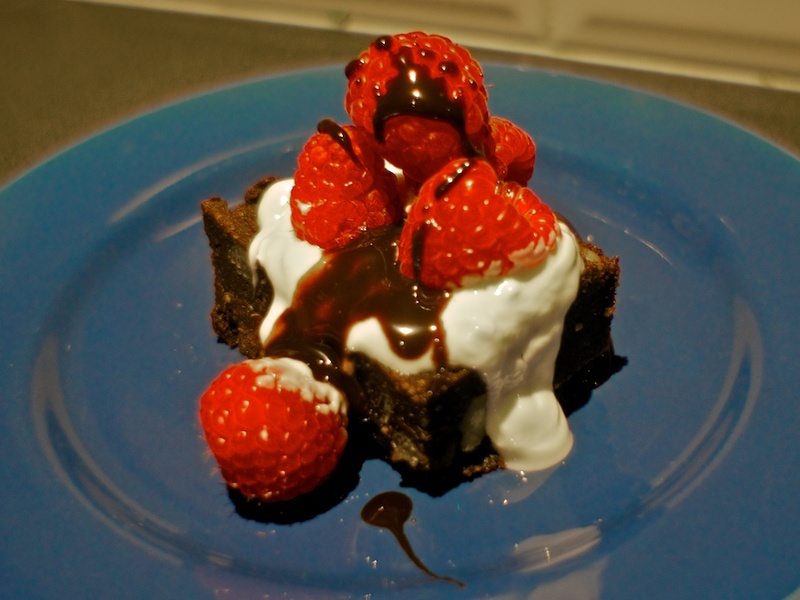 Autumn Coles magazine also had a section on gluten free Easter recipes and decided to give this gluten free brownie a try as but different as uses ground up gluten free rice cakes as the base. Preheat oven to 150 degrees celsius and grease and line 20cm square cake pan. Place rice cakes in TM and grind on speed 9 for 1 minute or until fine crumbs, transfer to a bowl. Chop macadamias in the TM and add to the bowl, stir to combine. Place butter, chocolate, icing sugar and cacao in a saucepan and stir on low heat until melted and smooth. Add to rice mixture and mix to combine. Put into cake pan and smooth the top with a spatula. Bake for 15 minutes or until just set, cool in the pan. Dust with icing sugar and slice into fingers. Serve with raspberries and either cream or ice cream. One of the best blogs for gluten free and Thermomix is Quirky Cooking. Jo is amazing at creating tasty and healthy recipes and I have tried many but this latest one just might be my new favourite. We had some salmon for Good Friday and wanted to do something different, Aubrey wanted a curry, so best of both worlds with this recipe. We did not have any quinoa and so used basmati rice instead which came out like coconut steamed rice. Check out the recipe and Quirky cooking blog here. I have tried making gluten free pastry before for a quiche and lets say it was not very edible, just at the filling! So was with some doubt that decided to give this chickpea crust a go as demonstrated (and taste tested!) by Rose at the Gluten Free Expo. I could not find dal flour so ground down half a cup of green lentils (from the soup aisle!) and half a cup of brown rice to flour in the Thermomix. I transferred this to a bowl and then processed a can of drained chickpeas to a paste in the Thermomix and then added to the flour mix with a pinch of salt. Once this was mixed well together I added a little vegetable oil until becomes the consistency of play dough. You then press this into a quiche tin (with the removable base) and up the sides to form a crust, no need to blind bake it. I then made the quiche filling with four eggs and 1 cup of milk mixed together. Then it is just a case of adding any left over ingredients or things have on hand. The first quiche I made was a cheese, bacon and onion quiche with fetta cheese and sprinkled with tasty cheddar on top. 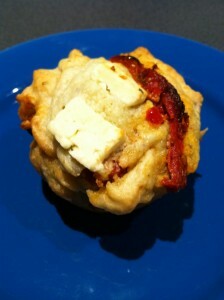 This weekend I made a spinach, mushroom, sun dried tomato and sunflower seed quiche with goat cheese fetta. 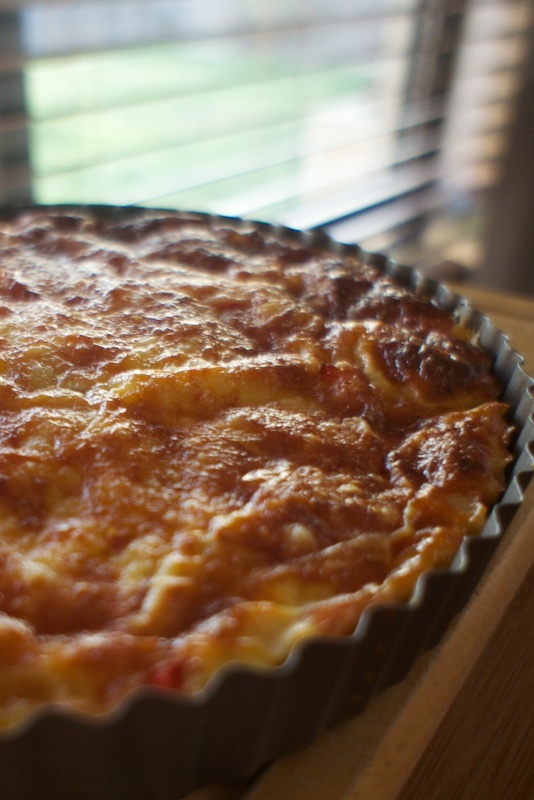 Both tasted delicious and the crust if able to be sliced and comes out of the quiche tin easily and holds together yet it is easy to cut and eat, not like some of my previous attempts as gluten pastry or crusts which you could not cut or chew! It is starting to get cooler and I felt the need for a casserole instead of meat and salad for dinner. The autumn Coles free magazine had a really easy recipe that uses the gluten free Outback Spirit Pork Kakadu Plum sausages. Heat frying pan on medium and cook sausages for 4-5 minutes turning once until well browned. Removed from pan and set aside. Heat oil in same pan and cook onion for 5 minutes or until soft. Add bacon and cook until browned. Add tomato passata, handful of chopped basil and 1/2 cup of water. Season and simmer for 5 minutes. 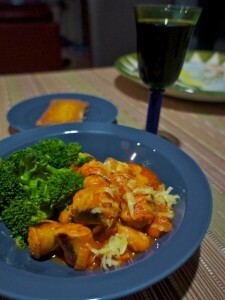 Thickly slice sausages and add to tomato sauce and simmer for 5 minutes until cooked through,. Now I have the hang of the muffin mix consistency required can make many variations. On the weekend I tried making savoury muffins with sun dried tomato, fetta, pesto and sunflower seeds. They are delicious warmed up with light cream cheese for lunch and would be lovely with pumpkin soup. I then used the muffin mix to make a dark choc and orange loaf. I substituted the 1/4 cup of sugar with Natvia from my WBC gift pack and boiled an orange and blended it in the Thermomix to add to the batter. 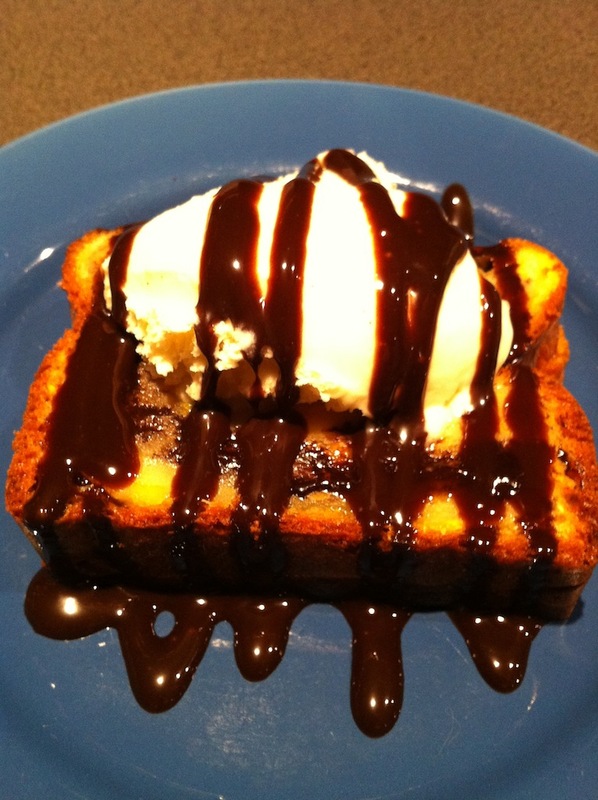 I used dark choc chips in the centre which make a chocolate sauce in the centre of the loaf which comes out more like a pudding and is delicious warmed up with vanilla bean ice cream. Gluten Free Expo & Cooking Demo with Rose! I made the trip up to the gluten free expo on the weekend, did not get to it in 2011. I was glad I did for the cooking demo by Rose from Balingup alone. I have eaten many times at the Balingup Bronze Cafe with its 100% gluten free and delicious menu. Rose is inspirational and for someone who cannot cook she inspires me that I can learn! I would love a cookbook and recipes with precise amounts but coming to value the need to learn to cook by getting a feel for the texture and consistency required. So that in mind I came home from the expo and attempted white chocolate and raspberry muffins which were always a must on trips to Balingup. I could not find any Dal (or Dahl?) flour locally so stuck with the Orgran SR Flour mix but you can use a mix of flours and add some GfG (gluten substitute from Orgran) but remember the GF baking powder as I forgot with first batch and they came out flat and rubbery!!! I added about 2 cups of SR flour, 1/4 cup raw sugar and about half packet of Nestle white chocolate melts. Then I mixed 1/2 cup of vegetable oil and 2 eggs together and added some greek yoghurt. I combined the flour mix with egg/oil mix and had thick consistency before adding about 1 cup of milk added last and slowly so does not become to runny a mix. The after spraying muffin tray with oil added tablespoon as base, added frozen raspberries and then topped with more muffin mix. Cooked in hot oven (210 degrees celsius) for 10 minutes and then lowered temperature to 180 degrees celsius for the remaining 15 minutes. Make sure you let the muffins rest and I was not sure cooked completely so turned oven off and left in there bit longer. Served with a icing made from remaining white chocolate melts and tablespoon of greek yoghurt and some vanilla bean ice cream. Have stored rest in the fridge and freezer and they freshen and fluff up with 10-20 seconds in the microwave. So book into one of Rose’s upcoming workshops, you will be glad you did and so will your taste buds! Sourdough part 2! Disheartened by the lack of rising of my buckwheat sourdough I decided to tackle the brown rice sourdough but was running out of time so tried baking it in the bread maker using a gluten/wheat free cycle. It actually did not turn out too bad, a little overcooked and dry/cracked crust. It tasted nice and toasted very well, actually toasting where as other “cake like” gluten free breads just warm up rather than toast. For more details on making gluten free sourdough check out Yoke Mardewi’s new book Sourdough here. In anticipation of all this lovely bread I also used the Thermomix to make strawberry jam and lemon butter. 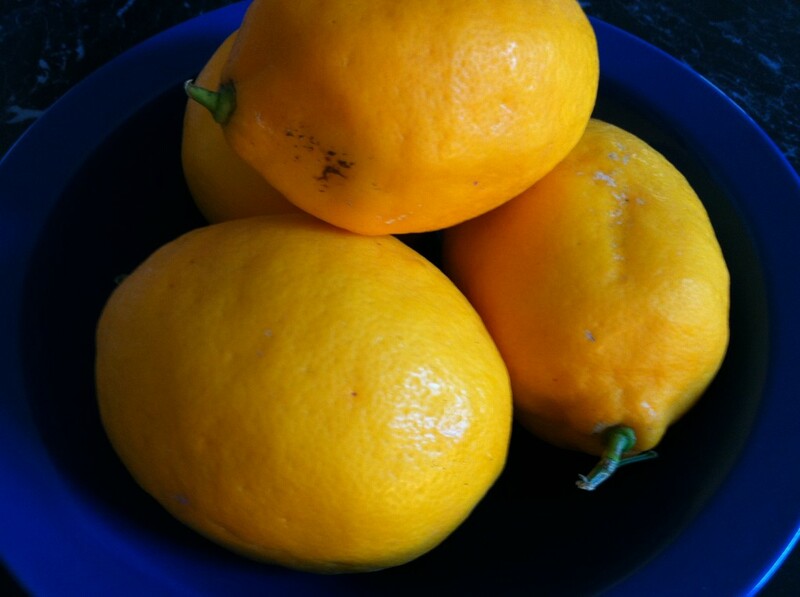 My friend from yoga gave me some lovely juicy Meyer lemons and these are just perfect for making lemon butter with. Insert butterfly into TM bowl and add all ingredients. Cook for 8 minutes at 80 degrees celsius on speed 3. Check to see if mixture coats back of spoon, if not cook for a further 2-3 minutes or until desired consistency is achieved. Place in sterilised jars and chill until thickened. 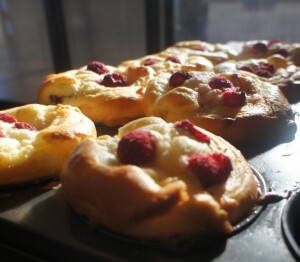 Yummy on fresh bread or can also use to make lemon tarts or lemon meringue pie if can master some gluten free pastry. I have ventured into the world of sourdough! To continue to seek a decent and nutritious gluten free bread I bought Yoke Mardewi’s new book Sourdough which includes sections on gluten free sourdough. All week my kitchen bench has looked like a science lab with different gluten free starters bubbling away including buckwheat and brown rice flour. D-day was on the weekend and my patience and persistence was about to be tested! I think I might have overfed my buckwheat/sorghum sour dough starter as when used it to make the Everyday Sandwich Loaf recipe it did not rise much even after more the 5 hours. I baked it anyway and it took less time than in the recipe and was expecting a brick to come out the oven and go straight into the bin! 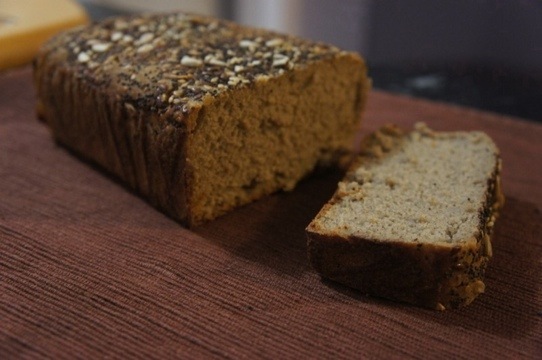 Surprisingly while it came out a dense bread with chewy crust the taste was good with the hint of sour and the distinct buckwheat taste and nuttiness. But as you can see from the photo bread did not rise! Back to the drawing board and not sure if have killed my starter and if need to start again! My brown rice/linseed starter looks more promising! 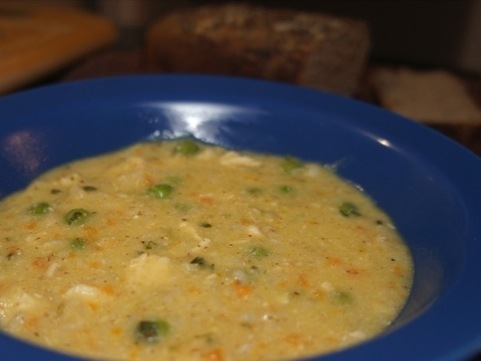 To go with the sourdough, on what was not the best weather despite being spring, we had some chicken and brown rice soup. 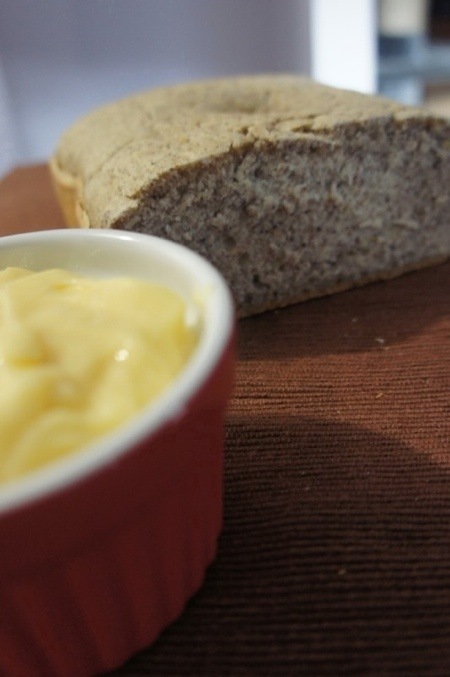 Thanks to Quirky Cooking for this gluten free and thermomix recipe which you can find here. It was delicious and very filling, more than enough for dinner with some bread. Next time think I will add some sweetcorn as goes so well with chicken and a little more tamari for flavour. 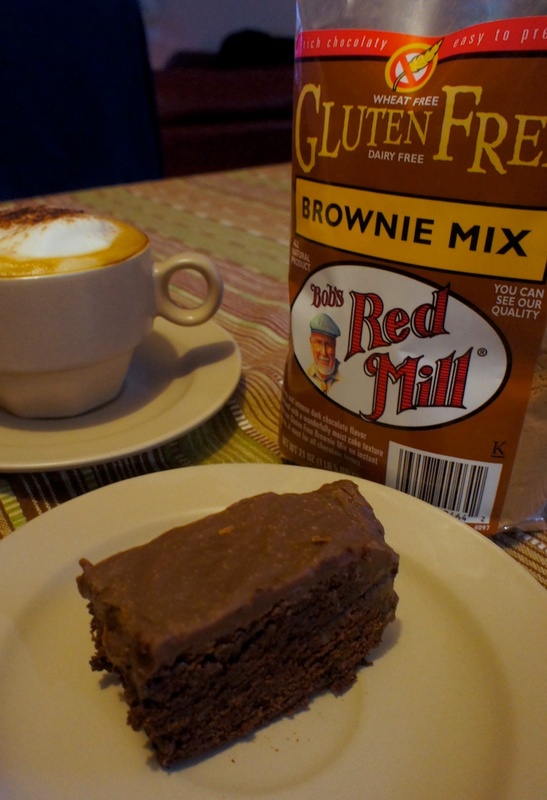 Rusticana has Bob’s Red Mill Brownie mix and I made them on the weekend and added the fudge topping – delicious and not helping my pledge to eat healthy on return back to Australia! Preheat oven to 180 degrees celsius and spray a 13×9 inch cake tin with baking spray. Place Brownie mix into bowl (or TM) and then beat in 3/4 cup melted butter or margarine, 1 egg, 2 tsp vanilla and 3/4 cup warm water and mix until just combined. Stir in 1/4 cup dark chocolate chips and/or 1/4 cup chopped pecans. Spread batter into prepared pan and bake for 25-30 minutes or until skewer inserted in centre comes out clean. For fudge topping combine 400g tin sweetened condensed milk, 1 tsp vanilla extract and 350g dark chocolate chips in a heavy saucepan over a low heat until chocolate chips melted. Remove from heat and spread mixture over warm brownies. Allow brownies to cool and then cut into bars. Delicious served with vanilla bean ice cream.